Gaming | No Chic. Just Geek. Another run-in with the Lizardmen this week, but only at 1000 points; a different opponent, too. It’s still early days in terms of my getting a sense of what the most common armies in my area are, but Skaven and Lizardmen certainly seem to be a regular sight on the local tables. I rejigged my standard 1K list, partly because I wanted to try out a small unit of Forsaken, and partly because a close re-reading of the rules revealed my general’s magic item selection was a tiny bit illegal. In came the Forsaken and a Nurgle Spawn, out went a unit of Warhounds and a couple of arcane items, and my main Warrior unit got the Mark of Nurgle. As usual I was left somewhat envious by the sheer amount of toy soldiers virtually every other army seems to get at 1K compared to mine: on this occasion the Lizards turned up with a big block of Saurus Warriors, a small regiment of Temple Guard, five Saurus Cavalry, three Ripperdactyls, and a swarm of Skinks, led by a Skink priest and a Scar-Veteran on a Cold One. Three Warhound deployments gave me a decent sense of how the Lizardmen would be advancing – Sauri and Cold Ones in the centre, Temple Guard and Ripperdactyls on my right flank, while the Skinks would be lurking in some woods on my left. Bearing this in mind I put the Chaos Warriors down centrally, supported by the Spawn and the Forsaken, while the Chariot and the Marauders went down on the right. The three spells I had wound up with were Doom and Darkness, Fate of Bjuna, and Purple Sun of Xereus (I’ll come back to the wisdom of this and its impact on the battle later), and my mood was distinctly lifted when, with practically the first dice roll of the game, I fired off Purple Sun and destroyed half of the main Saurus Warrior block, whose very low initiative made them horribly vulnerable to the spell. Things went on in this vaguely positive vein as the Saurus Cavalry charged the Chaos Warriors, clipping some woods in the process and losing two of their number, allowing the Warriors to deal with them fairly easily. The Temple Guard were lured by Warhounds into a position where they could be frontally charged by the Gorebeast Chariot and the Marauders. The Temple Guard put up stiff opposition, especially when the halberdiers in the back of the Chariot fluffed their dice rolls, but were eventually hacked down (the cold blood rule effectively made the Lizardmen combat troops almost impossible to break). However, our old friend New Model Syndrome made an unwelcome appearance as the Forsaken first failed the easiest of charges into the Scar-Veteran and then, when they finally got into combat with him, ended up with Strikes Last as their mutation that turn. This allowed the Veteran to hack them all down, not least because the Skink Priest had been casting Wyssan’s Wildform and/or Beast of Horros on him every turn. The following turn he sorted out the Spawn as well, leaving him in a position to take on the Chaos Warriors (who had just wiped out the Ripperdactyls). At this point a nasty wrinkle in the Chaos Warrior rules became apparent: the requirement to issue a challenge whenever possible. Neither of the characters in the Warrior unit realistically had a chance against the Scar-Veteran, and the small unit lacked the static resolution to make up for the sizeable overkill the Lizardman hero would be scoring every turn. The fact that some poor choices when it came to dispelling the Skink’s magic had left the augmented Saurus with somewhere in the region of seven attacks at strength nine didn’t help much either. The unit champion and then my general were chopped to bits on successive turns and the unit broke (confessions of a dummy gamer: I forgot about the Banner of Discipline, which would have kept them in the fight and given me a chance to beat up the Saurus with the rest of the unit in the following turn). The Scar-Veteran duly chased down the Warriors , but on a more positive note the Chariot got into the flank of the Saurus Warriors (who hadn’t really been doing much following their first-turn magical mauling) and broke them, cold blood for once proving ineffective. This resulted in one of those uneventful endgames, with the surviving units scattered across the table and no prospect of further combat – the Skinks loosed a few darts at the Chariot, which took a couple of wounds before withdrawing out of range. So we counted up the scores and it turned out that the final tally was 805 to the Chaos Warriors and 750 to the Lizardmen – a draw, which I suppose was a fair result. My chances of a clean win were scuppered by the reign of terror from the Scar-Veteran – small Chaos Warrior units are quite capable of being monstered by single top-tier combat characters like this one, largely because of the Eye of the Gods rule. Bearing this in mind, the failure of the Forsaken to perform could have made a big difference – on any other result they would have been striking first, potentially delivering 12 attacks with re-rolled hits. I think my sorcerer underperformed, as well, probably due to my spell selection. The casting of Purple Sun was my only real success all game – okay, a significant success – partly due to bad dice but also because I had three high casting value spells in the first place. In retrospect I should have swapped Doom and Darkness for Spirit Leech – the only viable target for the spell was really the Scar-Veteran, while Spirit Leech could potentially have zapped the Skink Priest from across the table and got rid of those annoying augment spells. Not sure how useful this is in terms of general strategy, though. This game has left me really wishing I could sneak a proper combat character into the list – wreaking havoc with a Chaos Champion is very appealing, but it would mean going on the defensive magically and I’m not sure of the wisdom of that given how destructive many spells can be. Something to consider in the couple of weeks before my next game. With my usual immaculate timing I have invested in a new set of knives just at the start of gunfight season: the unexpected onset of 7th Edition 40K does not exactly make it easy to secure pick-up games for WFB. At present I have no plans to invest in the new edition (this doesn’t mean I may not indulge in some paranoid speculation about what’s going on with the rush-release of a major rules-set at some point in the near future, naturally) but, as luck would have it, managed to secure a match-up with a pretty experienced and very agreeable Lizardmen player with a somewhat-retro (and extremely garish, even by Lustrian standards) army. This was my first game at 2000 points so to (theoretically) take the competitive edge off the game we played a scenario: the Lizardmen would be defending a watchtower and if I could shift them out of it by the end of the game I would win. A big block of Sauri went down in the tower, while marching across the table to relieve them were six Kroxigor, two Salamanders, another twenty Saurus Warriors, a Stegadon, three Terradons, and two units of Skinks, all led by a Slann and a Skink Priest. I still feel I am pushing it a bit at 2000, with a lack of solidity on the table. I had brought six Ogres of Nurgle (first use! ), a Hellcannon (first use! ), twelve Warriors of Nurgle, twenty Marauders, a Gorebeast Chariot of Slaanesh, a Mutalith (first use! ), and four units of Warhounds, led by a Sorcerer Lord of Death and a battle standard bearer (first use!). Well, as you may or may not know, like every other pastime WFB has a specialist vocabulary of sorts – we players happily talk about things which might baffle normal people, using expressions like cocked dice, static combat resolution, flank charge, tactical deployment drop, and so on. We also use the dreaded words ‘New Model syndrome’ and I found myself a martyr to this in this game, possibly more than ever before. This put a bit of a dent in my mood, but once I had collected myself I found the battle mostly going pretty well: the Warhounds all got blowpiped to death, but thatwas hardly a surprise, but the Ogres battered the Kroxigor and chased them off the board, the Chaos Warriors engaged the advancing Saurus Warriors and after a grinding combat broke and ran them down, and – after another tough fight – the Gorebeast Chariot charged and killed the Stegadon. However, the Mutalith was, frankly, behaving entirely unreasonably. Surrounded by a swarm of increasingly baffled Skinks whose blowpipes seemed unable to penetrate its hide, I tried for six successive turns to cast the bound spell which is the main reason you put it on the table. Four times I tried to roll a total of 5 or higher on two dice and failed. Once I managed it and the Slann dispelled it with dice; once I rolled a 21 (I was getting slightly fixated by this point and chucked all my dice at it) and the Skink fished a dispel scroll out from somewhere (my opponent was genuinely apologetic about this). So I still have no real sense of how this thing performs other than as a fire magnet. And killing the Lizardmen army wasn’t winning me the game: I needed to take the tower, but didn’t have the right unit in place to do it. Baseline Marauders are not going to shift Saurus Warriors from a building without magical assistance of some kind – two or three assaults from them just resulted in the unit being thinned down. The remains of the Chaos Warriors had a go, doing some damage and taking none in return, but in range of the Slann the Sauri were not going to budge. In the closing stages of the game the Slann magic really started to bite, as the Mutalith and Ogres were successively banished into the Pit of Shades, and things got to the point where I just didn’t have the models left to mount a serious assault and opted to concede the game. Well, this was a clear loss for the Warriors of Chaos, mainly due to my inability to challenge the garrison in the tower. Possibly my Warriors or Ogres could have done this, but they were both in the wrong place – and I’m not sure the Marauders could have dealt with either the Kroxigor or the advancing Saurus Warriors. As it was, the two armies pretty much wiped each other out, with the exception of the garrison unit which was still in reasonable shape. This suggests that in a standard pitched battle the Lizardmen would have had the edge – but then again virtually a quarter of my army (the Hellcannon and Mutalith) had no offensive effect on the game whatsoever. Had either of them actually showed up things might have gone very differently. That said, I was pleasantly surprised by the wallop packed by the Ogres, who were mainly there to bulk out the army (it was them or some Hellstriders and perhaps another character). Possibly they were lucky in their combats with the Kroxigor and Salamanders in this game, but they have earned their place for the time being. The Chaos Warriors got their first proper test as well, and despite my concerns over the size of the unit they managed to deal with a larger Saurus Warrior unit fairly comfortably: I still think an extra half-dozen models would make the regiment considerably more effective. The Lizardmen army has not changed much since the last time I played them, which must have been in 2005: a cloud of poisoned darts obscuring a few competently-wielded maquahuitls. The Saurus Warriors are nasty, but manageable (says the guy who just lost the game largely due to the hardness of Saurus Warriors); it’s the Skinks who are the real pain in the neck. Killing them in close combat is easy; getting into close combat with them is very difficult, and if you ignore them then you are surely going to regret it. I must confess that it seems to me that the Lizardmen have much to commend them as an army, and when the stars are right I may paint a few myself. In the meantime, I may drop the Mutalith and use the points to bulk up the Warriors a bit. The Marauders have proved distinctly underwhelming against anything other than frightened Skaven, but I’m not sure what to replace them with, and they do provide bodies and ranks for what’s otherwise a very elite army. Part of me just wants big blocks on the table, but that’s not something I’m likely to be able to satisfy playing Chaos. Well, with a long staff meeting-free afternoon in prospect, I had two games of WFB lined up this week – against High Elves at 1500 amd Skaven at 1000 points (a rematch from last week). When I arrived I found both my opponents waiting and it was suggested that the two of them team up against me at 2000 points – but I didn’t really have enough toys with me, plus my imagination recoiled from the idea of a Skaven-Elf alliance. So I counter-offered a three-way Triumph & Treachery game at 1000 points, which meant we would all get to play at once (although it did mean I wouldn’t get to use my Giant or the Mutalith I spent last Saturday painting, nor indeed my bodged-together battle standard). Everyone turned out to be up for it, so off we went. I had the same army as last time, the only slight tweak being a switch from the Lore of Death to that of Nurgle: Warriors, Marauders, a Gorebeast Chariot, many Warhounds, and a couple of Spawn, commanded by a Sorcerer. The Skaven had reorganised themselves and now comprised a big Clanrat regiment, a smaller Slave unit, twentyish Plague Monks, and the Doomwheel, led by a Warlord and a couple of wizards. The High Elves hailed from the realm of startersetdom and featured a noble on a Griffon, sixteen Seaguard, and about a dozen Swordmasters, led by an Archmage (‘fairly appalling at 1000 points’ was the majority opinion on this). Once we’d figured out the three-player rules the game got under way, and initially it looked like the Skaven and Chaos Warriors were intent on taking each other out first: there were scores to settle and the High Elf force looked tiny anyway. Through a combination of bad play and, er, worse play, I ended up with a pack of Hounds contesting the central objective, but my general’s unit being charged by the Doomwheel and flanked by the Skaven Clanrats. Sneakiness could only fend off the inevitable for so long and the unit broke, ending up in front of the Griffon which had executed a long flanking move. Having had the guts blown out of the Marauder unit by a surprisingly accurate Skaven firework on the same turn I was feeling very much on the back foot at this point. I got some respite as the High Elves went on the offensive, although this did result in the Griffon running down and killing my Warriors and general and earning a huge stack of points. Elsewhere the Archmage devastated the Slaves using Fiery Convocation and the Swordmasters annihilated them on the charge, which caused the Skaven general to shift his attention fairly smartly. The Doomwheel and Clanrats duly charged and easily killed the Griffon and its rider, but this left them a long way from the centre of the board, while the gas mortar blew itself up as well. The easiest targets for the remains of my force were the Seaguard, while the Swordmasters had charged the Gorebeast Chariot in the flank, thinking it an easy target. But both this combat and the one between the Hounds and Marauders and the Seaguard ground on for a number of turns, until the Chariot managed to break the Swordmasters and run them down, taking out the Archmage as well (much to the relief of the Skaven, whose units had grown accustomed to spending most of their time on fire). This left me with a tough choice on my next turn – carry on fighting the Elves, which looked a marginal prospect at best and meant the Chariot would be charged by the Plague Monks, or suspend hostilities with the pointy-headed ones and stick the Chariot into the Monks? I opted for the latter and the Chariot ploughed into them, killed half a dozen for no wounds in return (just as well as it only had one left) and left them testing on a 7 for their Steadfast leadership. They blew it and the Chariot ran them down as well. The downside was that the Elves were now able to break the truce and charge down the Marauders on their own turn. The Marauders caved in and were run down. We’d agreed this was to be the last turn anyway and the Skaven player conceded his final turn: despite killing the Griffon, and easily having the strongest force left on the table, he was a distant third on points. The Chariot’s trail of slaughter had actually put me back into the game, but even my control of the objective didn’t give me quite enough points to sneak past the High Elves, who had done serious damage to both other armies and were close on the 1500 VP mark. Still, a fun game: not quite sure how useful it is in terms of learning my army, though. My general feeling I need more infantry has not changed, and neither has my impression that the Gorebeast Chariot is an incredibly resilient and nasty piece of kit, quite capable of taking on ranked infantry unsupported. We enjoyed the three-player dynamic a lot, though the game did last about four hours, and I think I will be trying to stick to regular two-player or team games in general. Still, every chance of another one of those next week, and my Hellcannon arrived, which means I may even get to shoot something. New experiences are very important. So, the long road back to marginal Warhammer competence, stage two. A slight change of approach this week – I had a game lined up in advance, against a relatively new player hailing from Copenhagen (I should have entitled this ‘Playing the Dane (Or ‘Warhamlet’)’). We each knew the army the other was bringing, not that I had many options when it came to list-tailoring, and that wasn’t exactly the point of the exercise. Having done some research and tapped the brains of better players of my acquaintance, the 1K army I turned up with was rather different from the previous week’s – the cavalry and Daemon Prince were gone, along with one of the heroes. Promoted to the generalship was a Chaos Sorcerer of Death tooled up to channel on a 4+ and with three spells at level 2. Having blown my Hero allowance on this guy I was obliged to move on to the Core section where the same 12 Chaos Warriors and 20 Marauders as last time were now accompanied by four units of five Warhounds. A new addition to the circus was a Gorebeast Chariot, while using up my last 120 points were a couple of Spawn with various Marks. The Skaven army I was facing had lots of infantry but not much else: 40+ Clanrats with spears, 40+ Slaves, 20 Clanrats with hand weapons, accompanied by a Doomwheel and two gas mortar weapon teams. Leading the ratty horde was a Warlord and a Warlock Engineer. Part of the thinking behind taking all the Warhounds was to give me some flexibility in deploying, and I was indeed able to react to the Skaven. The two enemy units which gave me pause were the big Clanrat regiment and the Doomwheel, and they went down on the extreme flanks, leaving the Skaven army with an invitingly soft centre. In response, behind the Warhound skirmish line the two Spawn went down opposite the Warlord’s unit, with the Warriors and Marauders in the centre, and the Chariot on the right opposite the Doomwheel. I got the first turn and advanced across the board, positioning the Warhounds to interfere with the Skaven advance as much as possible. Just how effective the Chaos magic phase was going to be became apparent when I was able to kill the Warlock outright with Caress of Laniph and then use Doom and Darkness to knock down the small Clanrats’ leadership. Obviously a bit intimidated by the advancing forces, the Skaven stayed put, apart from the Doomwheel which smashed into a Warhound unit, wiping it out before overrunning to a point in front of the Chariot. The Poison Mortars killed a couple of infantry, but not enough to concern me (yet). On my turn the Chariot counter-charged the Doomwheel and one of the Warhound packs charged an unwisely-positioned Poison Mortar. Everything else ground forward. The Sorcerer hit the Doomwheel with Soul Blight, meaning the Chariot was able to smash it apart for only a single wound in return. With this done the Skaven right flank was pretty much open and it was relatively straightforward to roll it up, while using the two Chaos Spawn and the surviving Warhounds to keep the Warlord and his Clanrats tied down, using Doom and Darkness to negate the Skaven’s Strength in Numbers rule. Even so, I was a little surprised by how hard some of the Chaos units hit: the Gorebeast Chariot comfortably beat the small Clanrat unit unassisted and drove it off the board, while one of the Spawn was able to beat the Skavenslaves in combat – they popped, doing ten automatic hits on it (but only one wound). In the end Caress of Laniph saw off the Skaven Warlord and I was able to charge the Clanrats with the Marauders and the Chariot simultaneously (they already had a Spawn of Slaanesh lodged in their flank). Failing their fear test, and debilitated by Soul Blight, the Clanrats were in no state to put up any resistance: the Marauder Chieftain hacked down his opposite number in a challenge and earned himself a 6+ ward save, while between them the Marauders, Chariot, and Spawn killed getting on for half the unit. In the end the Clanrats lost the combat by 12 points, broke, and were run down. The field belonged to Chaos. Well, my two star performers were obviously the Gorebeast Chariot, which reduced everything it touched to a bloody smear, and the Chaos Sorcerer (let’s not mention the miscast where he blew up a third of his own unit). The Lore of Death was devastating against the Skaven, and losing their only wizard on turn one really put them on the back foot. Beyond this, I am fairly happy that I still have some idea about how to use Warhounds as tactical nuisance units, but I am also aware that this was a game against a relatively new player with a non-optimal list. In fact, we spent most of the post-game chat talking about how he could strengthen his army. I would suggest he needs more shooting of some description, ideally something which could take out my Warhound units, and also some kind of magical defence – a dispel scroll might have preserved his Warlock Engineer past the first Chaos turn. Though I didn’t say it at the time, splitting the 40+ Skavenslave unit into two units of 20 might be a better use of his resources. He also felt he was lacking in a proper combat unit, and I suggested either Stormvermin or Plague Monks (based, it must be said, solely on their statlines). I am looking forward to taking this army to a larger size, though I haven’t written a particular list yet. For 1500 I think more Chaos Warriors and a battle standard are going to be essential (not that the Chaos Warriors actually got into combat this game). I must confess that I am currently having a whale of a time painting a Mutalith and am contemplating disregarding most tactical advice and actually taking it to the table. We shall see: there are fewer lessons in victory, but it has other compensations. Someone check the Book of Revelation for signs of the looming apocalypse – yup, I’ve finally had a proper game of 8th Edition WFB. Ironically, after protracted flirtation with Vampires, Ogres, Empire, and Orcs and Goblins, I ended up going into battle with a force mainly composed of a Chaos Warrior army I first bought while recovering from suspected malaria in 2009 (ah, happy days). It was a bit of a shock when I recently realised that I’ve been out of the game for over eight years, especially given I was only really in it for seven prior to that. And my involvement as a ‘serious’ player – someone who thought about winning in a systematic way and went to tournaments and so on – only really started in my last year or so. Still, I have found myself increasingly missing the challenge of actual wargaming, probably partly due to the unique tactile and immersive nature of the hobby (compared to computer and board games, anyway), and finding myself very disenchanted with 40K these days, I finally had the motivation to cobble a decent WFB force together. I understood that 1500 was a reasonable sized game for fantasy day at the local gaming venue, so this was what I brought along. To be fair, this was a stretch and definitely involved scraping together (almost) everything I could get my hands on. Marshalling the very small horde was a winged Khornate Daemon Prince with various toys, supported by an Exalted Hero and a Sorcerer of Fire. A dozen Chaos Warriors and twenty Marauders bulked things out a tiny bit, with mobility provided by two minimal units of Warhounds and some spear-chucking Marauder Horsemen. Rounding things off was a minimal unit of Chaos Knights. I procured an opponent prepared to put up with my endless checking of the rules (and tendency to still use 6th ed rules regardless), although – he eventually revealed – he was using an (it seemed to me) extremely competitive Orc and Goblin list: a huge block of about 100 Night Goblin archers, a much smaller mob of 15 or so Savage Orc Big ‘Uns, two Bolt Throwers and a Doom Diver, and a selection of characters. As a long-term Orc player in the wayback, this wasn’t a list I would ever have taken, mainly because he was cherry-picking characters to suit strategy rather than theme: a Black Orc Warboss but no Black Orc infantry, for example, and a Goblin Battle Standard in a Night Goblin unit (I found myself getting misty-eyed for 5th when this sort of thing wasn’t so easy). We’re back to the old question of winning ugly vs. losing pretty, and I will hold up my hand and admit that my insistence on playing to theme and aesthetics is probably one of the main reasons why I am at best only a very middling player of any of these games. And, fairly predictably all things considered, I got tabled in four or five turns. While his war machines were a reasonable target for my Warhounds, it quickly became apparent I had no realistic way of countering the magical bombardment coming out of my opponent’s Great Shaman, and short of a series of lucky flukes no chance of breaking either of his units in combat (the 50+ 5+ poisoned shortbow shots coming out of the Night Goblins every turn was a bit troubling too). List aside, some of the rule changes in 8th did trip me up a bit. I was not completely clear on how the challenge rules operated, resulting in the Daemon Prince being beaten to death by Savage Orc rank’n’file while the champion hid at the back of the unit, and the ability of units to reform even in the middle of combat was a hell of a shock. Big units now seem incredibly resilient, especially when accompanied by a general and a standard bearer (again, the 5+ poison coming off the Night Goblins made this unit considerably nastier). I managed to kill one bolt thrower, a handful of Savage Orcs, and about 30-40% of the Night Gobbos, this last mainly due to repeated castings of Piercing Bolts of Burning on this massive unit. My opponent assured me this was not a disastrous performance, but I found myself inclined to make The Face as the game went on and the sheer extent to which I was out of my depth became apparent. On the other hand, the challenge of mastering this new version of the game and coming up with a more competitive list is a rather engaging one. Several things occur to me. First is the caveat from a strategy tactica on a major gaming site, stressing that if you play without a strategy against someone who has one, you will almost certainly lose. Fair enough. I need to play smaller-points games where I don’t need to put all my points into big fragile targets like Daemon Princes and actually think more strategically when making my unit selections. Quite what that strategy will be I will need to think about. Second, the complete absence of cavalry or monsters from the Orc and Goblin army was notable. On one level this is a blow as I do love a good monster in my armies (doubly so given I’ve recently bought a big box of various monsters and monstrous cavalry), but I suspect I love winning more. The prevalence of big block infantry in the current meta(if this game was representative) will entail dropping stuff that can’t stand up to infantry in a protracted slugging match. I can’t currently foresee a time when maxing out my Lord allowance on a Daemon Prince will be a good investment, and the same really applies to spending 250+ points on a 5-strong heavy cavalry unit. Thirdly. A rather good, if unfinished, guide to army design in 8th Ed, stipulates a number of must-take units for any army capable of employing them. These are a battle standard, a large cheap infantry block, a small fast (cheap) sacrificial unit, cheap core missile troops, a cannon or stone thrower, and a chariot. Knowledgable readers will already have noticed that not all of these things are present in the Chaos Warrior list, but even so this looks like a decent place to start thinking. And lastly, of course, how did my existing army actually perform? ‘Terribly’ is of course the glib answer, but I did kill a bolt thrower outright and took a hefty chunk out the Night Goblin ubermob. The units responsible were the Chaos Sorcerer and the Warhounds. My Slaaneshi Beasts army in the wayback included, if memory serves, four units of six Warhounds and I think more will be joining the current army. And having seen the Night Goblin Great Shaman dominate this game, I think I shall try including a Chaos Sorcerer Lord in a couple of games and see how that goes. Of course, given the lack of focus on massed infantry in the Chaos list, it has occurred to me to switch back to my old Vampires project, with plentiful (if cruddy) cheap skeletons and zombies available. That would mean either not playing for months while I paint massed undead, or getting games in with a weak Chaos army, not learning much useful about my own army, and probably becoming very depressed by repeated drubbings. I shall stick with the Chaos Warriors for now. At 1000 points, I can include the Warhounds, the Warriors, the Marauders, and a Chaos Sorceror from the existing list. Unfortunately this exhausts my current supply of units from the ‘recommended’ list (can’t even afford a lvl 2 Sorcerer and another character at 1K). Glancing over my various options (Horsemen, Knights, Dragon Ogres, a Giant, and so on) I suspect the least bad option for such a small game is a small unit of Chaos Ogres and a couple of Spawn of Slaanesh. But looking at that ‘recommended’ list again – a battle standard I can well see the value of. Cheap sacrificial Warhounds I need no persuasion about. I was thinking in terms of a chariot already. I suppose a larger Marauder infantry block, possibly with a Mark, is also a possibility – I will need the ranks. However, there aren’t really any core missile troops in the list, and is a Hellcannon going to fill the same role as a regular cannon? Back to the army book I fear. At least I have plenty to occupy me. It occurs to me that writing in detail about my successes and (mostly) failures on the wargames table is neither especially useful or interesting. I play equally tactically sophisticated and challenging board and card games, not to mention computer games, after all, and don’t inflict a turn-by-turn account every time I play Qin or Battle Line or Total War. But I do think 40K is different – you invest a lot more time and money preparing for a game, after all, to say nothing of the whole interface between the creative, narrative, strategic and tactical elements of the game is not really comparable to anything else. On the other hand, it’s that same unique interface which has been causing me so much grief with respect to 40K – as far as the current edition is concerned, I just feel as if I’m being very unsubtly pushed towards buying certain big and expensive models simply in order for my armies to remain competitive. Bearing this in mind, I was only mildly hopeful of victory when turning up to play the other day because I was playing a relative newcomer to the game, who would not be packing the giant monsters and attack fliers that everyone seems to be building their armies around currently. I had my Consecrators army, built under the 4th ed rules and never previously used in 6th. At 1500 I could fit in the Master of the 1st Company, three units of Terminators, a Land Raider Crusader, a firestorm Dreadnought and a unit of Scouts. I expect I could have mustered 1750 but, to be honest, I was half-thinking about pick-up games and didn’t think I’d face too many fliers and whatnot at the smaller game size. Heh and indeed heh. While waiting for my intended opponent I did indeed get mixed up in a pick-up at 1500, with an Eagle Warriors army… containing two Storm Talon attack fliers and a Thunderfire Cannon. Yaroo. Those really grabbed my attention, but also in the list were two mechanised Tactical Squads, an Assault Squad led by an uber-tooled-up combat character, a Stalker, and three Centurions. Well, the game fell into three stages. I won the initiative and teleported the Master and his squad in, and rather jammily panicked the Eagles’ commander and his squad off the board on turn one. Then I found out, quite painfully, what the grav-cannons on the Centurions could do as my Terminators were slaughtered. More good luck ensued as the Master took refuge in combat by assaulting the closest Tactical marines, supported by Terminators from the Crusader, and miraculously avoided killing them all, thus keeping me safe from the Centurions in the next Eagle Warrior turn. By this point the Dreadnought had killed the Thunderfire Cannon but was itself destroyed when both Storm Talons arrived and targeted it. The second Terminator squad assaulted the Centurions and crushed them fairly rapidly, though not before they had inflicted heavy damage on my third and final Terminator squad and killed the Master with overwatch. The climax of the game came as the surviving Terminators beat up the last Eagle Warrior infantry and rhinos – this may have been a mistake as the exploding vehicles took a tally on my very limited forces. The Crusader managed to wreck a Storm Talon that had switched to hover mode, but the other one shot down my last Terminator in the final moments of the game. I had an unscathed Land Raider and a lone Scout left on the table; the Eagle Warriors had their Stalker and the Storm Talon. Neither of us held the main objective, and with both warlords dead, my having killed a unit on the first turn and his having a Storm Talon on my board edge it was a 2-2 draw. Frankly, I was lucky, and in killing the Storm Talon and Thunderfire Cannon I felt I’d exorcised a few demons too. Following a quick break and a heartfelt plea from the owners of the venue for the assembled gamers to deodorise more thoroughly in future (always a sign of a classy, mainstream spot if you ask me), it was time for my game against the Ultramarines. This game was to be settled solely in terms of units wiped out and this rather dictated my strategy. The Ultramarines were led by Marneus Calgar in a Crusader, and I was pretty sure I would be in for an exceptionally tough fight if I went up against him directly. So I didn’t and just concentrated on wiping out the smaller, weaker units making up most of the Ultramarine army: five-man squads of various types. This worked rather well, with my Terminators assaulting the Ultramarine flanks under covering fire from the Scouts, Dreadnought and my own Crusader (the Scouts went to ground whenever anyone looked in their direction to get the 2+ save for being in cover). I managed to rack up plenty of early points and it did seem that Calgar didn’t know which way to jump – it wasn’t until turn five that he finally disembarked, by which point the Master had wiped out two squads and was making a tactical retreat to avoid giving up two VPs should Calgar manage to kill him. All my other Terminators got wiped out again, but by this point the army had accounted for two Tactical Squads, a Sternguard Squad, some Terminators, some Devastators, three Centurions, and Chief Librarian Tigurius (who spent the game locked in an interminable ding-dong battle between the Centurions and a mostly-lightning claw armed Terminator unit, and never cast a single power). With first blood taken into account it all added up to an 8-3 win for the Consecrators, but I was fully aware that the inexperience of my opponent was one of my biggest assets. So a win and a draw, both lucky. I’m still not sold on the viability of a pure Deathwing army under the new rules, but then this wasn’t really a pure Deathwing list (and I’m not seriously considering tinkering with it). Time to work on something new and – hopefully – solidly competitive, while still being aesthetically satisfying. Well, blame the new Eldar codex, or my old Eldar army – one of the two, anyway. The new book appeared and I decided to dust off the army and give it a test drive. Suffice to say the Blood Ravens turned up with two Thunderfire Cannons, two fliers, and nearly a dozen Terminators and I was blasted off the table in short order, only managing to take out a handful of Tactical Marines in return. Coupled to my growing misgivings about the emphasis of the sixth edition, it was enough to make me take a sabbatical from the game (another of my semi-regular bouts of under-employment didn’t help matters much). Oh well. I have been feeling the odd pang of the desire to play and/or paint again recently, and I was in town today anyway for work, and rather than go all the way in and back solely for one lesson, I thought I might as well see how things lay on the wargaming front. Out came the Blood Angels again. And so I found myself squaring off against a neophyte Ultramarines commander – the signs are fairly easy to distinguish – in an exercise of the Emperor’s Will (one main objective each plus the usual minor ones). Not being familiar with the new Marine Codex I was wary, but at least I had an army I knew backwards. Both objectives were placed in the centre of the table, which suited me, and deploying first I set up for a major push on both of them. My Terminators and Baal Predator went into reserve, while ready on the right flank for a lightning advance was a Rhino carrying a Tactical Squad, a full Assault Squad accompanied by Captain Zedrenael, Chaplain Aukon and a Priest, an Attack Bike and a Land Speeder. Posted on a hill in the centre was Honoured Brother Akakos, hastily retrofitted to a standard dreadnought configuration (CC/AC). The Ultramarines put a lot of stuff into reserve – starting with Marneus Calgar and an Honour Guard. There was also a Librarian here, a Sternguard combat squad, and three Devastator Centurions. Actually on the table, a mechanised Tactical combat squad, an Assault combat squad, a foot Tactical combat squad and a Devastator combat squad occupied the centre, while over on the right flank a Land Raider Crusader carrying Assault Terminators set up facing the bulk of my own forces. Anyway, I retained the initiative and began my assault by landing a Drop Pod as close to the Ultramarine-placed objective as I could manage. This was my first time using a pod and I was curious to see how it performed. A full Tactical Squad spilled out, while behind them the rest of the army moved up. On the first turn the Pod Squad mowed down the majority of the Devastator combat squad and left me well placed for a second-turn assault. The Ultramarines responded by attempting to land a Dreadnought by Drop Pod on the board edge close to the bulk of my army – however, it scattered off the table and was destroyed. The Land Raider Crusader moved forward along the table edge anyway, disregarding the multi-meltas my army was toting. Apart from the surviving Devastator, who redeployed towards the right flank, the remaining Ultramarine contingent fired on and assaulted the Pod Squad, though without doing much damage. On my second turn both my reserve units turned up: the flame tank outflanked and toasted the foot Tactical combat squad, while the reassuring presence of the locator beacon in the Drop Pod meant my Terminators were able to come on safely, close to the Devastator. The Attack Bike and Land Speeder fired on and destroyed the Land Raider, the Rhino-based Tactical Squad opened fire on and wiped out the Ultramarine Rhino unit, and the Blood Angels Assault Squad counter-charged the unit that had assaulted me the previous turn and wiped it out. The Ultramarines centre had been smashed, but their Terminators were intact and they had many potentially powerful units still in reserve. Marneus Calgar teleported onto the table with his retinue, behind the bulk of the Blood Angel force, while not far away three Devastator Centurions appeared. The Sternguard appeared in the far right corner, not far from the Baal Predator and Blood Angel Terminators. Marneus Calgar called in an orbital bombardment which vapourised Zedrenael and Aukon, while the Sternguard managed to kill two Terminators (a bit jammily, I thought – hey ho). However the Ultramarines were unable to assault and most of the Blood Angels were out of sight of the formidable anti-personnel firepower of the Centurions. Nevertheless the Ultramarine Terminators assaulted the Attack Bike and killed it, while the last Devastator shot down the Land Speeder. It was time to redeploy, so the Tactical squad piled back into their Rhino, which motored away, while the Assault Squad pulled back away from Calgar as well. The Baal Predator motored up to the Sternguard and flamed three of them, while the Pod Squad occupied the Ultramarine objective. The Terminators squashed the last Devastator, while Brother Akakos waded into the Centurions and killed two of them (they did not prove as resilient as I had feared). The Ultramarine Librarian finally showed up, but I was confident I had this game in the bag – I had two very mobile Troops units left, meaning I could either grab objectives or go for linebreaker points as the game closed, while the Ultramarines had only their elite units on the table. Things turned out pretty much as I expected – Akakos killed off the Centurions and then chased down and flattened the enemy Librarian, while a ding-dong battle between the two squads of hammer-wielding Terminators eventually saw only a single Ultramarine survivor (who Akakos promptly shot). Calgar and his squad handily slaughtered the Pod Squad and moved on to assault and destroy the Baal Predator: this did not overly worry me, as it meant they were pulled even further away from the objectives. The final few turns saw the Ultramarines frenziedly running around the table trying to kill anything they could get their hands on, regardless of the bigger strategic game. Their vastly depleted numbers meant they weren’t that destructive, however. In the end the last Sternguard was killed by the storm bolter on the Drop Pod, while Calgar’s retinue was wiped out when he assaulted the surviving Blood Angel Tactical Squad. It seemed somewhat fitting that the only surviving Ultramarine model on the table as the game ended was their Chapter Master, while I had a few Assault Marines and a Dreadnought left to hold objectives: probably not enough to actually kill Calgar, but I didn’t need to. One objective and First Blood gave me four points, compared to the solitary one the Ultramarines had earned for killing Zedranael. So – first thoughts on the new Marine Codex. I haven’t looked at it in detail, but Thunderfire Cannons are still absurdly underpriced and I suspect Centurions are very capable of laying waste to anything in their path if used correctly. The Chapter Tactics rules look interesting too; I think my best fortune in this game was meeting a relatively green opponent. Splitting his army the way he did made it very easy for me to rapidly crush his initially-deployed forces and then deal more carefully with his elite second wave. The army performed up to standard in this game, anyway, although losing the Captain and Chaplain to the same shot stung a bit. The big innovation this game was using the Drop Pod and I am rather impressed by the potential of this piece of kit, both as a way of getting Tactical Marines to the sharp end of the game and as an anchor point for my Terminators. 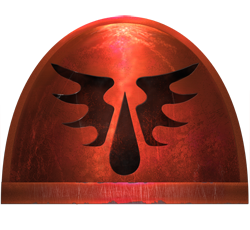 I am aware all I am really doing now is tinkering with the same basic elements when I play Blood Angels, so what the future holds for me collecting-wise I’m not sure. As it is, I had a really nice time just playing a good, challenging game against a friendly and cheerful opponent. And of course I got to inflict a crushing defeat on him, which is always a bonus too.